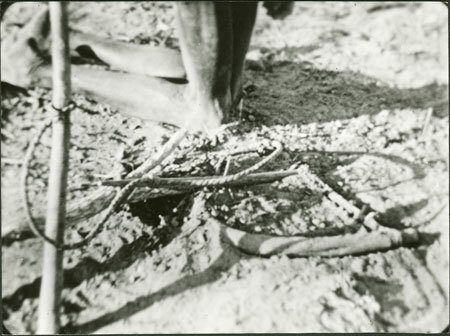 A close up of a Dinka animal trap (dang) set on a game path, having just been sprung by a stick. The Powell-Cotton's collected this trap, perhaps from the individual in this image, on the 3rd May 1933, and donated it to the Pitt Rivers Museum in 1934. It is likely that this print is a still taken from the cine-film made by Powell-Cotton during this expedition. Notes on print reverse Ms pencil - "No 9. Dinka Animal Trap. Trap sprung off. Fanamweir, Sudan 1933"
Other Information - Fanamweir is now located in the administrative district of Warab in the Southern Sudan. Powell-Cotton made ethnographic films during his 1932-3 shooting expedition to southern Sudan; footage included a Dinka hunter setting a trap: "In a game track a Dinka hunter laid a noose and set its weighty spring-trap, formed like a bow strung with twisted hide" (see the description in Mrs Powell Cotton, "Village Handicrafts in the Sudan", Man 34 (112), pp 90-91). There are several photographs of a Dinka man demonstrating the use of this trap in the Pitt Rivers Museum collection; see Accession Numbers 1998.207.3.1-9. Morton, Chris. "Dinka animal trap" Southern Sudan Project (in development). 03 Jan. 2006. Pitt Rivers Museum. <http://southernsudan.prm.ox.ac.uk/details/1998.207.3.9/>.